Google Drive is one of the best online storage services available today, however it may result quite restrictive if you are aiming to manage a large amount of business documents. In fact, it is very useful for storing and especially editing documents online (without the need to download them beforehand), but not as much when it comes to organizing and efficiently managing the entire document archive of a company. In this article you’ll discover how to manage your documents with maximum efficiency while continuing to edit and store them directly online, with the simplicity of Drive, but with the added benefits of using LogicalDOC (document management system), to recover them in a flash whenever you need by carrying our simple full-text searches based on content, tag assignment, extended properties and much more. Online storage services and document management systems. Are they the same thing? Before tackling any other topic we must first clarify one fundamental point in order to avoid misunderstandings. When I talk about online storage services (or cloud storage), I am referring to services such as Google Drive and DropBox. These systems are very simple and basic to use (between the two, Dropbox is even more limited when it comes to functionality). They mainly allow the user to store documents online, and share them in folders with other members of a team. Besides this, Google Drive features its own online editor that allows users to modify documents without having to download them onto a PC (which is extremely convenient, especially for those who frequently use a mobile device and do not always have a computer at hand). The document management systems, such as LogicalDOC, are somehow more comprehensive and complex. Generally they are used by medium and large businesses (recently even small enterprises have started using them more and more often) to manage and organize all their digital archive. They present many important features including the complete indexing of documents (which allows users to find any document instantly by searching for words or phrases contained in it), the automatic versioning (which allows for each document to retrieve and compare all the different versions of a document throughout time, avoiding unwanted duplicates), the management of permits to be granted to users, workflows, and much more. => To scan through all the functionality of the document management system LogicalDOC click HERE. In practical terms, we may therefore say that the document management system is the evolution of online storage services, a “more sophisticated relative” and definitely more suited for business. These two types of systems are therefore very distinct and do not compete with each other in term of functionality as you may think; on the contrary they are able to work together effective! LogicalDOC features an integration tool that allows users to connect to their Google Drive account, allowing leveraging the potential of both in a single solution. 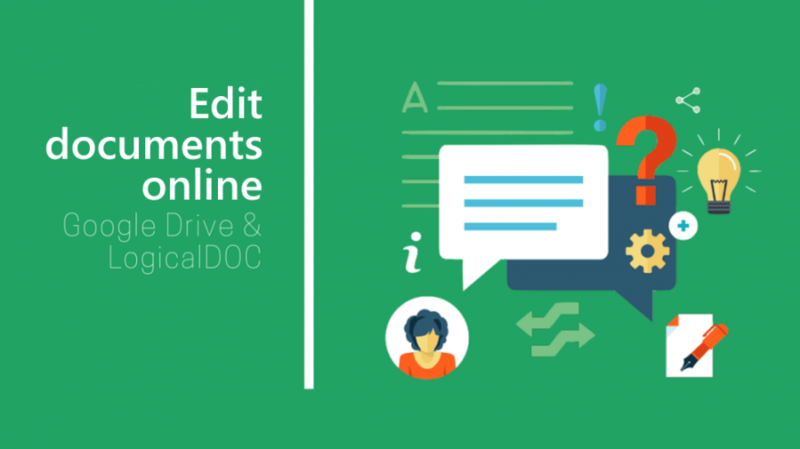 Thanks to this integration users can access a LogicalDOC account, select the documents they wish to edit from the archive and modify them directly online by using the Google Drive editor tool. In a nutshell, users have all the advantages of professional document management plus the simplicity and convenience of a main online storage service, all in one solution. This integration, however, is not limited to the online editing features; in fact, by logging into a LogicalDOC account it’s possible to import files from any Google Drive account with just one click. In this way, all documents will be indexed and available for full-text searches. Once imported, documents can be handled with greater efficiency by adding metadatas, including them into workflows, setting deadlines, permits, notifications and much more. But above all, users can create documents directly online (and without logging out of LogicalDOC) whenever it suits them, again thanks to the Google Drive editor. To know more about the usage, check out the manual. You’ll then have the LogicalDOC professional document management plus the best features of Google Drive, and you will be able to organize your documents in the best way possible.